If you think tie-dye originated in the 1960s, think again. While it rose to popularity in America during the heyday of the likes of Jerry Garcia and Janis Joplin, its roots actually go back way further–all the way back to ancient Asia. Tie-dye exists in some form in virtually every culture in the world, and while it was popularized in the United States during the hippie era, it has actually been a part of American culture since the 1920s. A tie-dye shirt is a classic garment that never really goes out of style. While its popularity waxes and wanes, it is something that you can almost always see people wearing. Some styles–like polyester leisure suits–have remained firmly in the past, but new generations continue to embrace tie-dye in its many forms. 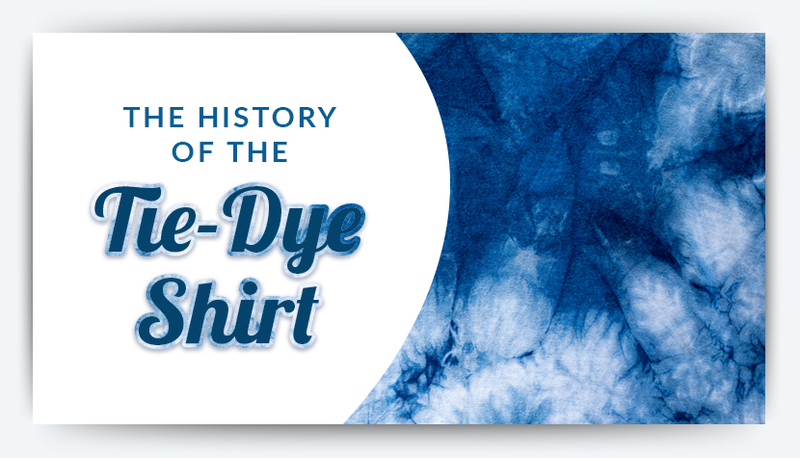 Let’s take a closer look at the tie-dye shirt throughout history. The earliest written records about tie-dye come from China and Japan. The process was used during the T’ang Dynasty between 618 and 906 C.E. in China and during the Nara Period from 552 to 794 C.E. in Japan. In these ancient times, people used natural dyes from things like berries, leaves, roots and flowers to color clothing and other fabric items. Marigolds, sage, onion, indigo, lichen and blackberries were all commonly used. To extract the color, the items were placed in boiling water. People then dipped the cloth into the water and allowed it to soak until the desired shade was reached. 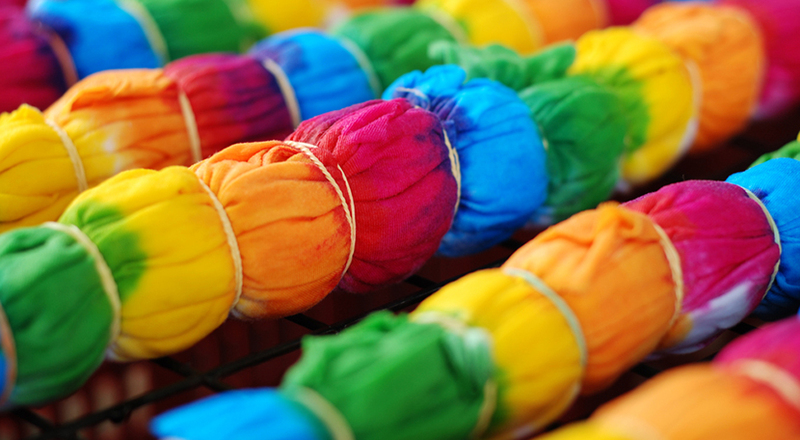 As early as the 6th century, Indian people were practicing a type of tie-dye known as Bandhani. This process involves using thread to tie off small pieces of fabric in intricate patterns. After the tying has been completed, the cloth is then dipped in dye. The tied sections remain undyed, and the resulting fabric features small dots. This type of tie-dyeing is still practiced today. Shibori is one form of tie-dye that originated in the 8th century in Japan and Indonesia. It is still practiced today in these regions and involves several labor-intensive resist-dyeing techniques, such as stitching elaborate designs and tightly gathering the stitching prior to dyeing. This process creates elaborate designs on things like kimonos. Another shibori method involves tightly wrapping the cloth around a core of wood, rope or another material and binding it using string or thread. This process makes it so that the sections of fabric that are under the binding and against the core remain undyed. During the Momoyama Period, which lasted from 1568 to 1603, a new type of tie-dyeing was developed. Known as tsujigahana, this process used a type of Chinese ink known as Sumi. Images were drawn or sketched onto the cloth using the ink and then the cloth was dipped into dye. This colored the fabric surrounding the design while making the design itself appear darker. Items of clothing made using this process were prized by their owners, and there are still many pieces in existence today. The process is also still used to make modern garments. In the United States, tie-dyeing first rose to popularity in the period known as the Roaring ’20s. It remained popular during the Great Depression of the 1930s when pamphlets were distributed telling people how to decorate their homes using the tie-dyeing process. These pamphlets detailed how to use things like old cotton, coffee, flour and sugar sacks to create household decorations and even clothing and dye them using the tie-dye method. The purpose was to show women how to create new-looking items without spending much money during difficult economic times. The 1960s is, of course, the decade most commonly associated with tie-dye. Just about everyone has seen the photographs of men and women clad in tie-dye apparel dancing and enjoying the music at Woodstock in 1969. While the style hadn’t been “in” for a few decades at that point, it saw a surge in popularity during the hippie era because it served as a simple and inexpensive way to express one’s creativity and individuality. No two tie-dye shirts looked exactly the same, which many of the people who lived during this era appreciated. Hippies longed to escape from the strict societal norms of the 1950s, and tie-dye provided the perfect medium for expressing their more free-spirited style. The now well-known brand Rit Dye owes much of its success to tie-dye. And the art of tie-dyeing owes much of its popularity to the brand. Prior to the hippie era, Rit Dye was struggling to stay afloat. One man, however, changed that. Don Price launched a marketing campaign for Rit in New York City’s Greenwich Village. 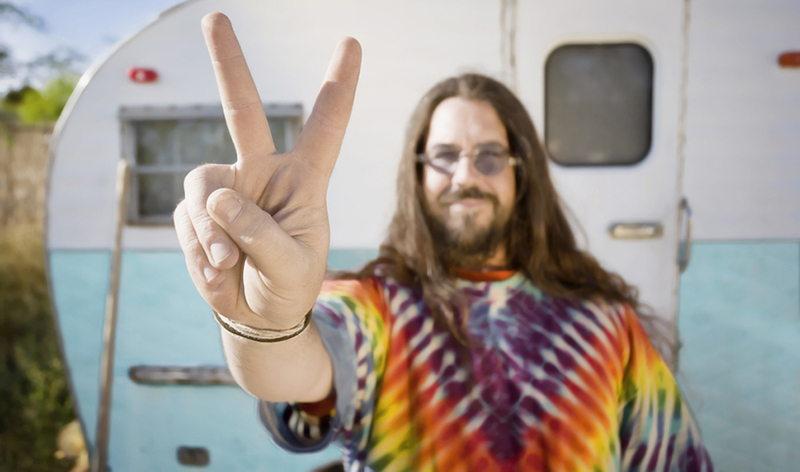 This community was home to many hippies, and Price went door to door asking artists if they would be willing to use Rit products in their tie-dyed creations. He met retired artists Will and Eileen Richardson who were willing to design tie-dyed garments using Rit Dye. Price showed those garments to fashion designers and editors, and the style was picked up by designer Halston. Once he started incorporating tie-dye in his fashion designs, big stars like Janis Joplin and Jerry Garcia started wearing it. The youth of America quickly picked up on the trend and the rest, as they say, was history. 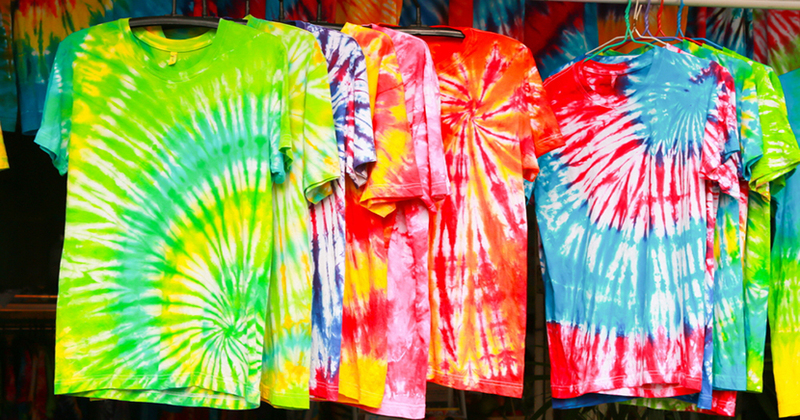 Throughout the 1960s and ’70s, tie-dye was used on much more than just t-shirts. The technique was used to create colorful banners, bags, blankets, tapestries and more. It became one of the most iconic looks of the time period, and there are still many pieces in existence today. Fashion from the 1960s and ’70s has remained a staple, and it tends to cycle in and out every few years. While tie-dye shirts tend to come back in style every few years, they really hit a high point during the 1980s. During this decade, designers began incorporating this look into their fashion shows. Changes in technology also made it possible for designers and manufacturers to create tie-dyed garments that were more resistant to fading than those made in previous eras. The new types of dye that hit the market during the 1980s had much greater staying power, and they offered a greater variety of shades and colors. Today, tie-dye shirts remain as popular as ever. They come in a wide range of colors and styles. From brightly colored swirls to more subdued pastels in subtle patterns, there are tie-dye styles that are suitable for just about everyone. And thanks to tie-dye kits that are available at any craft store and most big-box retailers, it is possible for just about anyone to unleash their inner fashion designer. 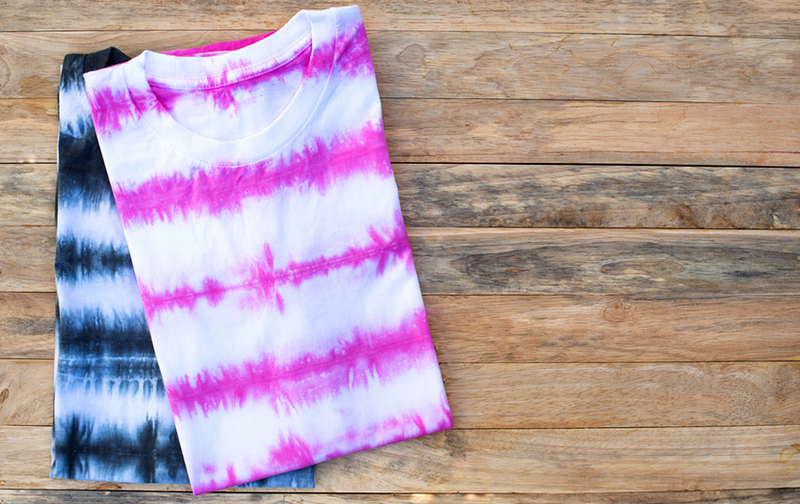 If you love the look of tie-dye shirts and want to make your own, getting started is easy. The process is inexpensive and while it’s pretty messy, it’s a great project for kids and adults alike. There are different methods of tie-dyeing that can be used to achieve different looks, but the process generally involves twisting, folding and tying fabric to control how the dye is applied to its fabrics. For detailed instructions, check out a detailed guide to tie-dyeing. Here are a few basic tips to help you get started, though. If you want to make your own tie-dyed shirts, you will, of course, need blank shirts. Ones that are made from absorbent materials like cotton, wool, nylon and silk are your best bet. Cotton does a great job of holding color, and you can make the color even brighter by adding a cup of salt to your dye bath. Other necessary supplies include rubber bands, scissors, squirt bottles, buckets for dipping, soda ash, a plastic covering for your work surface and old clothes or an apron to wear while you work. Rubber gloves are a good idea, too! Start by soaking your shirt(s) in a solution of soda ash and warm water. The soda ash helps ensure that the dye is absorbed efficiently and keeps colors bright. Let soak for about 10 to 15 minutes. While that’s happening, fill your buckets or squirt bottles with mixed dye. If you are doing intricate patterns, you will want to use squirt bottles so you can direct the color exactly where you need it. If you are dip dyeing, use buckets. Make sure all solutions are mixed thoroughly. Remove your clothing from the warm water and wring them out. Twist, fold or wrap them as desired, and secure with rubber bands. There are plenty of guides to help you determine how to fold or twist your shirt to achieve the desired effect. Once your shirts are tied, it’s time to start dyeing. Work from your darkest color to your lightest. Soak or apply color until it looks a shade or two darker than your desired final outcome. When you’re finished, put each shirt in a separate plastic bag and let sit. If you are going for pastel shades, you may not need to wait long. If you are going for a more saturated look, however, you should let your shirt sit overnight. After letting your shirt rest, carefully cut off the rubber bands. Next, rinse the dyed garment under the warm water. Reduce the temperature gradually as you rinse until the water is running clear and cool. Wring gentle and then hang to dry. Finally, wash your completed garment in cold water. The color will bleed for the first few washes, so either wash your new tie-tied shirt alone or with dark colors. Tie-dyeing may most commonly be associated with the hippie era, but its roots run much deeper. From ancient cultures to today’s arts and crafts projects, this process is one that has truly withstood the test of time.